← Today’s Watercolor: Buon Natale! Merry Christmas! メリークリスマス! I actually sent out traditional Japanese 年賀所 or nengajo this year! I always love receiving a big stack of of cards on New Year’s day, but I’ve always been daunted by the process of making them. I finally buckled down and put the work in this year–hand addressing 30 cards in complicated kanji took a minute. Even still, I barely even scratched the surface of all the cards I wanted to send, so if you didn’t get one, please accept this as your nengajo! You can see the traditional Kadomatsu decorations on either side of us, and of course I put a little Gunma-chan in, because while it’s usual to see a kitty under the kotatsu, this is the year of the horse. Nengajo often include the Zodiac animal of the year (last year was the snake, and it was amusing to see so many desperate attempts at making snakes cute.) So of course I had to include everyone’s favorite prefectural pony! 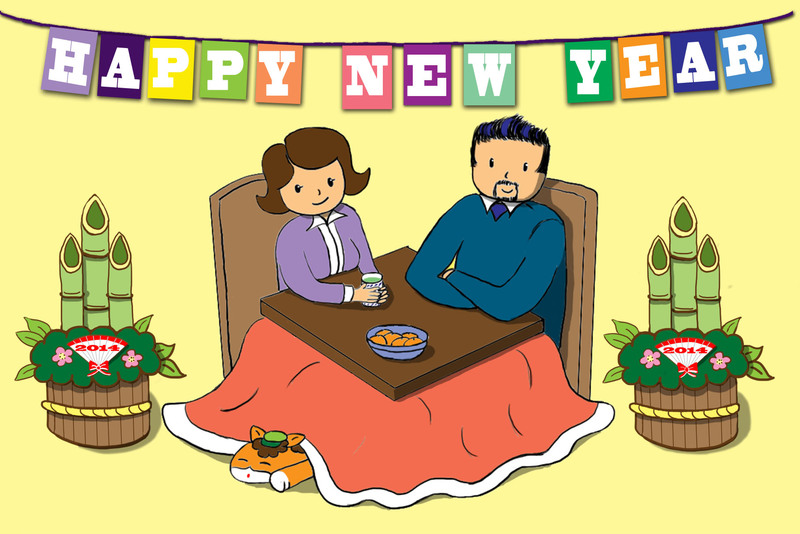 Did you send or receive New Year’s cards this year? How are you ringing in 2014? Happy New Year! This entry was posted in Art, Gunma, Japan, Modern Traditions and tagged 2014, alice, Art, bamboo, Gunma, Gunma chan, happy new year, kadomatsu, my art, nengajo, New Year, new year's card, new years, sean. Bookmark the permalink.